Deposits of facial subcutaneous fat confer not only volume but also support for the face. Fibrous retinacular tissues connect the dermis to the underlying superficial muscular aponeurotic system (SMAS), thereby compartmentalizing the fat layer into distinct fat pads, which are contiguous with each other across the face. Atrophy in one fat pad will result in loss of tension within the skin and the SMAS and manifest as sagging of the face1 . Due to this contiguity, tensing of one fat pad lifts adjacent compartments, while tensing of deep compartments produces a supporting effect on superficial compartments2. 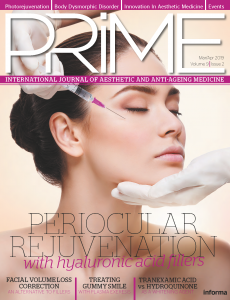 Hence, the Targeted FAT Lift was conceived as a non-surgical facelift using a high-elasticity hyaluronic acid filler to selectively re-inflate facial fat pads and achieve a mild but perceptible lift. The technique is cannula-based to allow greater tactile feedback during delivery of filler specifically into the fat pads. To quantify the degree of lift, we evaluated the effect of the Targeted FAT Lift on the appearance of jowls, as measured by the Merz Aesthetic Scales™ for the jawline, and successfully demonstrated here a 1-point improvement. While this technique focuses only on the fat pads, clinicians should be cognizant of the other underlying etiologies for a sagging face, namely skin elasticity and bone issues, and which should be addressed concurrently to achieve optimal outcomes. 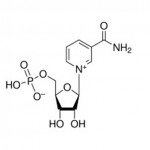 The target fat pads of interest, and the terminology used to identify them, are depicted in Figure 1A. A 56-year-old Chinese female presented with age-related facial sagging. There was superficial middle malar fat pad ptosis, commonly known as jowls; downward migration of the lid-cheek junction; prominent nasolabial folds; temporal fat pad and lateral cheek fat pad hollowing; and marionette lines. 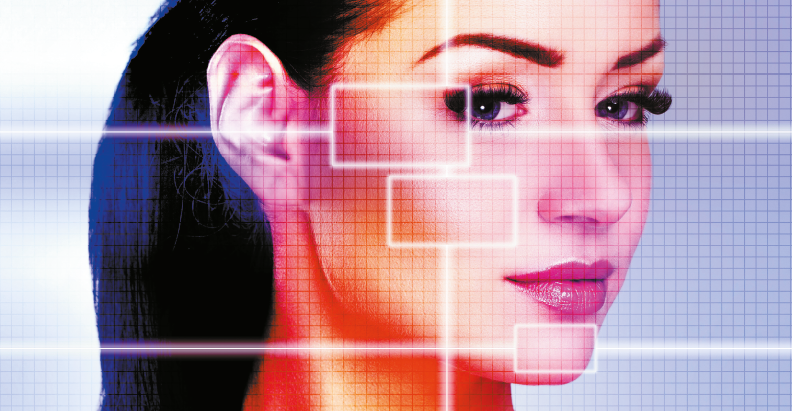 The jowl was selected for quantitative evaluation by the Targeted FAT Lift using the Merz Aesthetic Scales™ for the jawline as this was the lowest point on the sagging face. Changes in the jowls were objectively graded before, one-week, and 10-months post-procedure. Belotero® Intense was chosen for the lateral cheeks, malar areas and the chin for its relative high elasticity and cohesiveness. Belotero® Soft was selected for the under-eye and upper malar area. 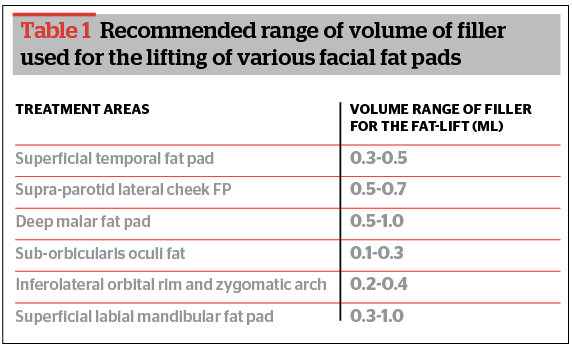 The targeted re-inflation of facial fat pads is divided into 6 regions (Figure 1B), starting with the superficial temporal fat pad and followed by the lateral cheek fat pads, deep malar fat pad and sub-orbicularis oculi fat (SOOF). The fifth region encompasses the inferolateral orbital rim and zygomatic arch, which, although not a fat pad by definition, is within the region of the other injections. The sixth and last region is the superficial labiomandibular fat compartment. The jowls (highlighted in white) should not be injected. For equivalent terminology, the temporoparietal fascia is also referred to as the superficial temporal fascia, while the deep temporal fascia is also referred to as the temporalis muscle fascia (Figure 1C). The deep temporal fascia comprises two layers: the superficial layer and deep layer. Injectors should note the hierarchy of tissue layers to ensure correct cannula placement (Figure 1D) within the superficial temporal fat pad, as placement in deeper fat pads will not result in a lifting effect. The goal of the first injection was to tense up the superficial temporal fat pad, and not to augment temporal hollowing. An entry point was created with a 23G needle in the skin over the zygomatic arch (Figure 2A). A 25G cannula was then inserted to the depth of the superficial temporal fat pad and gently advanced to the temporal region. Care should be taken to avoid puncturing the superficial temporal artery. 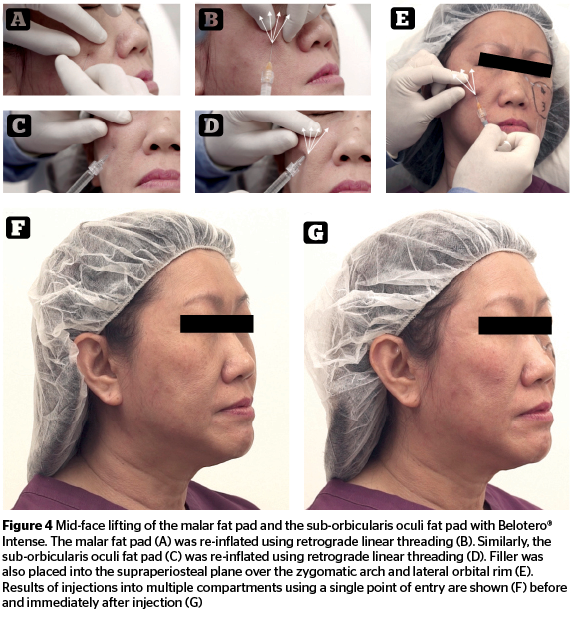 A total of 0.4 mL of filler was deposited using the retrograde linear threading method (Figure 2B) and spread superolaterally under the hairline with gentle fingertip massage to re-inflate the fat pad. As the superficial temporal artery runs in a plane just below the temporoparietal fascia, injections in the superficial temporal fat pad are generally safe, and use of a cannula improves tactile feedback. Nevertheless, the cannula should be moved slowly and gently to avoid penetration of that layer of fascia. Within the fat pad, the cannula should move freely, whereas resistance would be encountered if pressed against fascia or muscle. The goal of the second injection was to exert lateral tension on the other fat pads on the lower face. 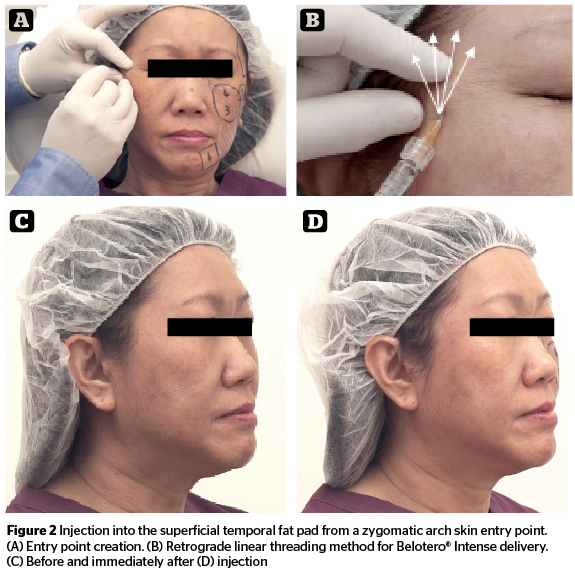 The lateral cheek fat pad, which lies superficial to the parotid gland, was targeted using the previous entry point (Figure 3A), with the cannula directed posterior-laterally and caudally. 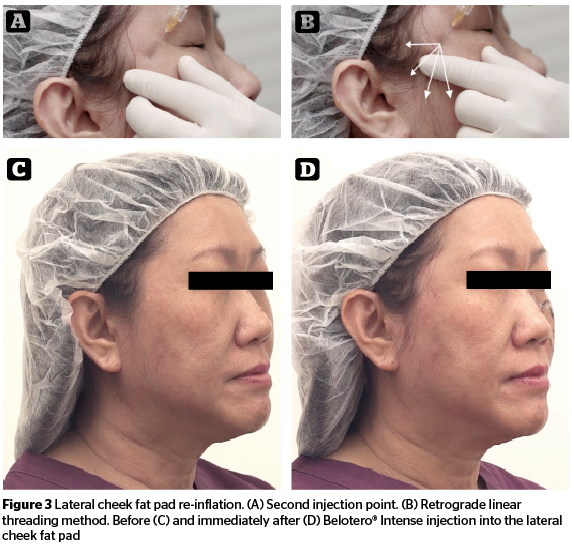 A total of 0.6 mL of filler was deposited by retrograde linear threading (Figure 3B) and spread throughout the lateral cheek fat compartment. The third injection point targeted the deep malar fat pad. After creating a mid-cheek skin entry with a 23G needle (Figure 4A), a 25G cannula was advanced towards the deep malar fat pad. 0.5 mL of filler (Figure 4B) was deposited. Care was taken to avoid infraorbital vessel trauma. The fourth injection point targeted the SOOF or tear trough area. A 27G cannula was advanced through the previous (mid-cheek) entry point, to the SOOF (Figure 4C). 0.2 mL Belotero® Soft was injected into the infraorbital area (Figure 4D) to support the skin and reduce lid-cheek junction hollowness. Although region five is not a fat compartment, augmentation in this tissue area is crucial as bone resorption occurs around the inferolateral orbital rim and zygomatic arch during aging and results in loss of tissue support. A 25G cannula was inserted through the previous entry point, directed towards the supraperiosteal plane and advanced to the zygomatic arch and inferolateral orbital rim. 0.3 mL of Belotero® Intense was deposited above the bone using linear threading with the cannula running tangentially to the zygomatic arch and the inferolateral orbital rim (Figure 4E) to mimic bony support. The amount of filler delivered was assessed to be adequate once sufficient tension of the above fat pads was created, and the jowls became lifted. There was no need to overfill to compensate for the initial swelling. This swelling was not expected to account for any more than 10% of the lifting effect. The goal for the sixth and final injection was to extend the chin in order to suspend the jowls. 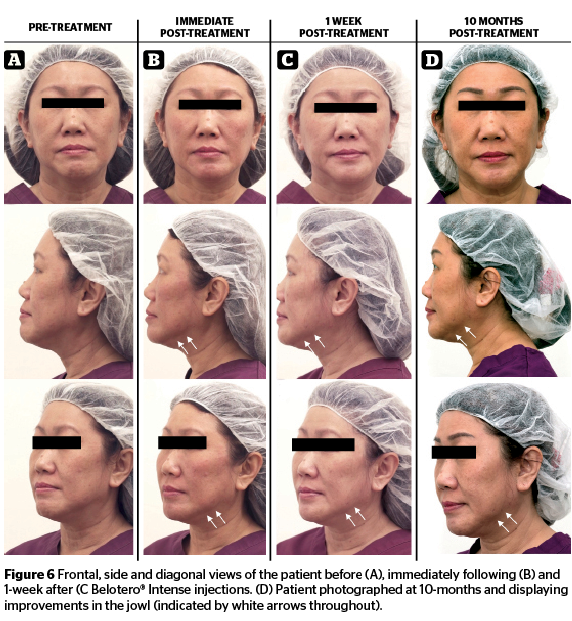 Chin lengthening and projection were not treatment goals, per se, as these interventions would require more fillers and injections placed at other depths. Treatment of this area is optional but recommended for advanced jowling. An insertion point in the mid-point of the chin (Figure 5A) was made using a 23G needle, and a cannula was advanced through the superficial labial mandibular fat compartment to the pre-jowl sulcus. 0.5 mL of Belotero® Intense threads were deposited within the superficial labial-mandibular fat compartment (Figure 5B). Tension here will produce a suspension effect on adjacent jowls. The jowls (highlighted in white) are ptotic superficial middle malar fat pads and should not be injected. The contralateral side was then treated as above, adjusting for facial asymmetry, if any. 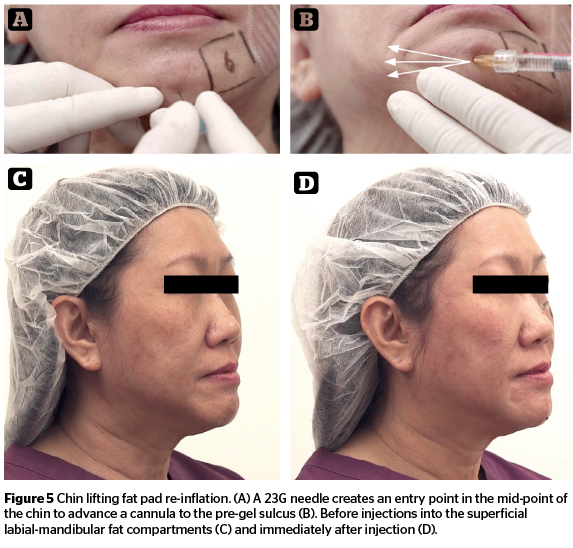 Following treatment in the chin area, sufficient tension was visible in the jowls, as was seen before (Figure 5C) and immediately after injection (Figure 5D). At 1-week post-injection (Figure 6), the swelling had subsided, and a 1-grade improvement was observed in the jawline, as assessed using the Merz Aesthetic Scales™ for this area. As evidenced by this patient’s results, the Targeted FAT Lift, through the targeted re-inflation of the facial fat compartments, produced a lifting effect on the SMAS. Besides the improvements in the jowls, the infraorbital hollows, nasal-labial folds, marionette lines and cheek volume were all also visibly improved (Figure 6G–I). At 10-months post-injection, the subtle, 1-grade aesthetic improvement persisted. (Figure 6J–L). 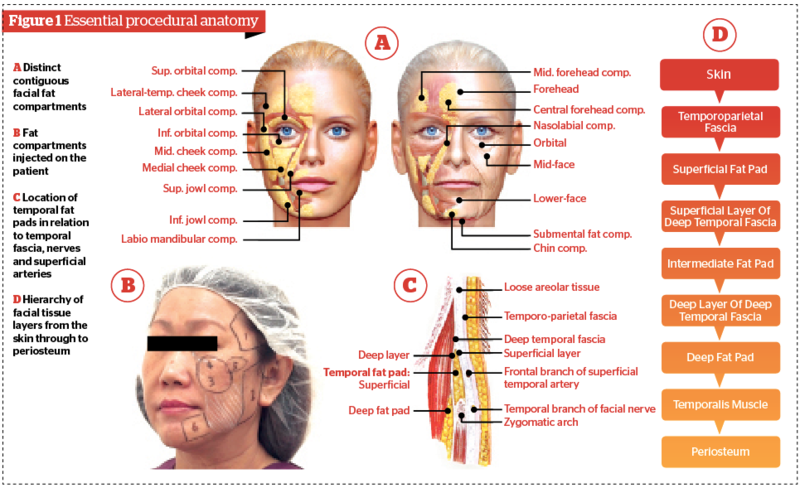 The authors evaluated SMAS laxity from the perspective of fat pad tension to conceive a novel, non-surgical facelift, named the ‘Targeted Facial-Aponeurosis-Tensing Lift’ or ‘Targeted FAT Lift’. The principle of the technique is targeted fat pad re-inflation using cannulas. Because post-procedural swelling or recovery times are minimized, the Targeted FAT Lift is ideal as a lunchtime procedure. It can be performed as a standalone non-surgical facelift, or as adjunct or combination therapy (e.g. with Ultherapy® and thread lifts)3. The authors also include here a recommendation on the volumes of filler that can be used for the various targeted facial areas (Table 1). The malar and infraorbital fat pads begin to atrophy as early as the twenties, followed by the superficial temporal and then the lateral cheek fat pads in the thirties and forties, respectively. 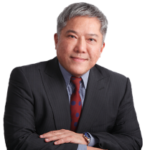 Hence, treatments can be customized for the different age groups, and more significantly, the Targeted FAT Lift can be used as a preventive treatment in younger patients, as it is possible to predict which fat pads will atrophy4. The use of cannulas as an alternative to sharp needle injections has been widely debated, and some guidelines to increase the safety of filler delivery do exist5,6,7. Sharp needle injections were deliberately not used in this demonstration as the tactile sensation of entry and presence within a fat pad is best discerned with a cannula. Sharp needle injections lack the tactile feedback required, and filler droplets may be inadvertently deposited in the skin or deeper layers. In a recent cadaver study, sharp needle injections at a perpendicular approach were observed to result in the retrograde flow of filler along the needle’s path of travel and filler was found to be inconsistently dispersed into multiple, unintended supra-periosteal tissue layers. In contrast, filler delivered through an oblique, angled, non-traumatic cannula was more accurately placed and thus thought to be a much safer tool8. Although filler injections outside of fat pads can produce lift, they do so through a different mechanism from the ‘re-tensing of SMAS’, which this technique seeks to demonstrate. Injectors should, however, feel free to use the tool (needle or cannula) that they are more comfortable with, bearing in mind the danger zones based on known vascular anatomy, and the risks of adverse events, such as bruising or intravascular embolization9. Injectors should also note that no clinical or animal investigations are available to conclusively indicate that cannulas are safer than needles for filler injections10. However, it is routine to use strategies such as small-bore cannulas to reduce the incidence of adverse events associated with such tools. This is not an endorsement of the use of the cannula over a needle. Through the targeted re-inflation of facial fat pads, the Targeted FAT Lift produces a one-grade improvement to the jowls as measured on the Merz Aesthetic Scale for the jawline, with demonstrable benefits to other facial areas, and can be used preventively to avert facial sagging. Declaration of interest The authors declare no conflict of interest. The authors declare that no funds have been received for the publication of this manuscript. Figures 1-6 Patient photos provided courtesy of Drs. David Loh and Yishan Phoon. Figures 1a & 1c illustrations provided courtesy of Merz Asia Pacific Pte Ltd.
de Castro CC. Superficial musculoaponeurotic system-platysma: a continuous study. Ann Plast Surg. 1991 Mar;26(3):203-11. Carruthers JD, Fagien S, Rohrich RJ, Weinkle S, Carruthers A. Blindness caused by cosmetic filler injection: a review of cause and therapy. Plast Reconstr Surg. 2014 Dec;134(6):1197-201. De Felipe, I., & Redondo, P. (2015). The Liquid Lift: Looking Natural Without Lumps. Journal of Cutaneous and Aesthetic Surgery, 8(3), 134–138.